There’s already a number of representatives being floated as a possible successor to the speaker. WASHINGTON — With House Speaker Paul Ryan’s announcement that he will be exiting Congress after this year, the internal jockeying to replace him as GOP leader has already begun. Ryan said Wednesday that he would serve out his term, in which case the speakership will not officially become open until after this fall's midterm elections. And the monthslong campaign to replace him within the GOP caucus carries a host of unknowns that could determine the outcome. First, members won't know until November whether they will be choosing a new speaker or a minority leader. If Republicans lose their majority in this difficult political climate, the calculations about new leadership could take on different dimensions. Should the GOP maintain a majority, a candidate would need at least 218 votes in the House as a whole to win, and it's almost certain that no Democrats would vote for any GOP candidate. For minority leader, a candidate has to just obtain the support of a majority of the GOP conference. In a body where ambition is not lacking, there’s a long line of people whose names are being floated as possible successors to the leadership mantle, and they come from every faction of the GOP. The top tier includes those who already serve on Ryan’s leadership team and would inherit the speaker's vast fundraising network that is so crucial to the position. Rep. Kevin McCarthy, R-Calif., is Ryan’s deputy and would be the most natural replacement. Like Ryan, he is a prolific fundraiser and has spent this election cycle proving those abilities. He is also a close ally of President Donald Trump, which would give him a major leg up. But McCarthy withdrew his name from the running last time the GOP leader’s job was open two-and-a-half years ago after saying the Benghazi investigation was mostly an attempt to politically derail Hillary Clinton. 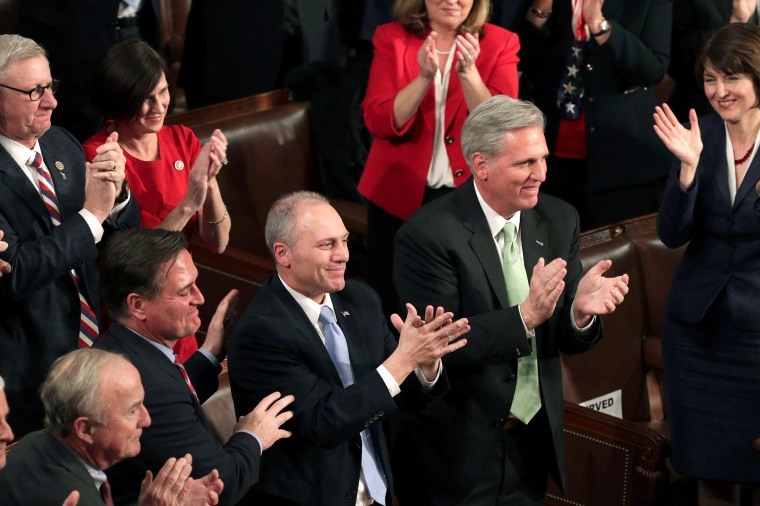 As the majority whip, Rep. Steve Scalise of Louisiana is the third-highest ranking Republican in the House and expected to be McCarthy’s top challenger from the leadership ranks. The former head of the conservative Republican Study Committee, Salise is considered to be a link to the more conservative members of the conference and is expected to make a serious run. Scalise’s stock has also risen after he was nearly fatally wounded in a shooting at a congressional baseball practice last year, sidelining him for months as he went through surgeries and therapy. He has made a rapid rise from being an unfamiliar congressman responsible for finding 218 votes on Republican legislation to a heroic survivor who made a miraculous recovery. Rep. Patrick McHenry, R-N.C., is well-liked by fellow Republicans who think he’s smart and has good political instincts. He’s a member of the whip team — Scalise’s deputy — and has come to know members extremely well through his work counting and rounding up votes, which gives him an advantage in any race for leader. Rep. Cathy McMorris Rodgers, R-Wash., is the only woman in the top ranks of Republican leadership, which could raise her profile in any leadership election should she choose to run. But first she has to win re-election in her western Washington district that could shape up to be close. Conservative Republicans have a history of challenging speakers who they think aren’t ideologically pure enough. A group of about three dozen conservatives in the House Freedom Caucus have considered challenging Ryan’s speakership and the group played a role in House Speaker John Boehner’s decision to leave the position in 2015.